Will you be updating the Laser level mod and the schematica mod to 1.9 any time soon? I really need those mods for 1.9. I really like these mods. Most likely a week or two after Forge releases for 1.9. Hello. I just wanted to ask how exactly it would be possible to move the Info box from the upper left corner to like the upper right one? It currently sits right ontop of one of the Map mods. I have a suggestion for InGame Info XML mod. Could you tell me about the progress on this? Not a lot of progress, but it should be possible. I'm not entirely sure whether I want to replace the current icons or offer another set of the icons with a parameter for this. ingameinfoxml version 2.8.1.81 on mc 1.9 and i keep getting a crash after the splash screen loads when trying to use with any forge above version 12.16.0.1817. [22:05:37] [Client thread/INFO]: No plugins for JourneyMap API discovered. [22:05:39] [Thread-9/ERROR]: Unable to initialize OpenAL. Probable cause: OpenAL not supported. [22:05:39] [Thread-9/INFO]: Could not locate OpenAL library. [22:05:39] [Sound Library Loader/INFO]: Could not locate OpenAL library. [22:05:43] [Client thread/INFO]: JourneyMap log initialized. [22:05:43] [Client thread/INFO]: [yalter.mousetweaks.Logger:Log:6]: [Mouse Tweaks] A call to initialize, entry point: FORGE. [22:05:43] [Client thread/INFO]: [yalter.mousetweaks.Logger:Log:6]: [Mouse Tweaks] Obfuscation check, please ignore the following errors (if they come up). [22:05:43] [Client thread/INFO]: [yalter.mousetweaks.Logger:Log:6]: [Mouse Tweaks] Could not retrieve field "ignoreMouseUp" from class "net.minecraft.client.gui.inventory.GuiContainer". [22:05:43] [Client thread/INFO]: [yalter.mousetweaks.Logger:Log:6]: [Mouse Tweaks] Obfuscation check completed. 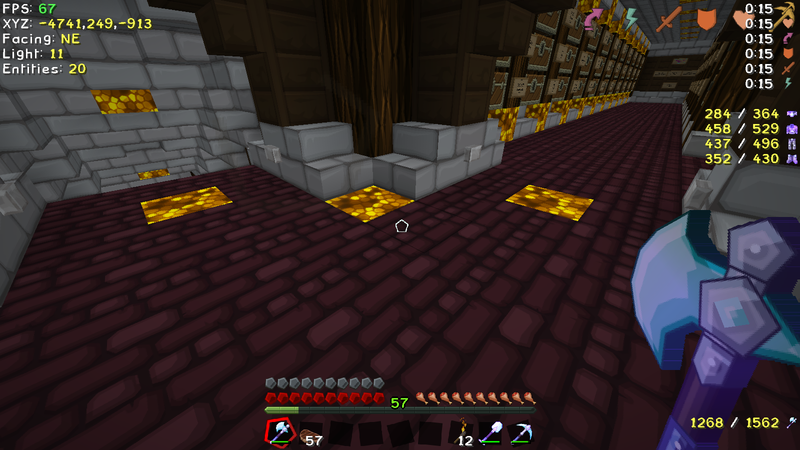 [22:05:43] [Client thread/INFO]: [yalter.mousetweaks.Logger:Log:6]: [Mouse Tweaks] Minecraft Forge is installed. [22:05:43] [Client thread/INFO]: [yalter.mousetweaks.Logger:Log:6]: [Mouse Tweaks] LiteLoader is not installed. [22:05:43] [Client thread/INFO]: [yalter.mousetweaks.Logger:Log:6]: [Mouse Tweaks] Using Forge for the mod operation. [22:05:43] [Client thread/INFO]: [yalter.mousetweaks.Logger:Log:6]: [Mouse Tweaks] Mouse Tweaks has been initialized. Come check out my pack and tell me what you think. Known issue currently. Most (if not all) of my mods require a recompile. Given that Forge 1.9 is currently not stable (breaking changes are being made) I'll hold off for another week or two before recompiling and/or fixing any bugs. By that time Forge for 1.9.2 should be out. I really love you work and how fast you updated it to 1.9, i really needed it ! I got a problem, i'm using Lunatrius Core and Schematica mod only, and my game crashes upon loading a schematic, be it in singleplayer or multiplayer, big or small schematic. I'm using the last version of Lunatrius Core, Schematica Mod, and Forge, all three for 1.9. My game crashes instantly after i load the schematic file into my world. I tried removing ressource packs, changing video settings, changing the folder from .minecraft to another one, deleting the .minecraft entirely then reinstall the whole game completely clean with only forge and your mods on it, but nothing worked. Thanks for reading, i hope you'll come up with a fix soon ! Downgrade to Forge 1816 for the time being. The (indirect) answer was in the last post in the thread already. It didn't work, i'm just going to wait for your newly recompiled mods i guess. Thanks ! It works. If you want to make sure revert back to 1811 - which is what I used to compile the mods. If you're using the vanilla launcher, make sure you have the correct profile and correct Forge version selected. People often run the wrong profile by mistake. I figured this mod would help me save some diamonds but no.. It's not a simple click/drag-and-drop mod. It offers complete customization, but comes at the cost of having to manually editing a config file (for now). Scaling of individual elements is currently not possible and most likely won't be supported. However, a global scaling factor is available in the global config. There are more fitting mods out there for what you want to do. They essentially remove the item from your hotbar to avoid the item held from breaking. If I remember correctly Auto Tools was one such mod. Houston, I've got a problem, I just created myself an awesome 1.9 modpack, and whenever I try to get LunatriusCore and In game Info to work, it crash, I've read it was a Forge problem, but I can't downgrade Forge version to 1811, most mods I use are requiring at least Forge 1832. I'll see if I can get something done about this today, wanted to check things yesterday but didn't have the time to do it. People don't even bother reading existing issues and I've closed over 10 duplicate issues by now, I'll just have to force a somewhat recent minimum build of Forge to be on the safe side. @Lunatrius, new InGameInfo 1.9-2.8.1.82 and LunatriusCore-1.9-1.1.2.34 works OK with Forge 1863. Thanks. Awesome, just what I was missing for my private personal modpack. Thanks for any help that you can give in advance. If Forge added the hook I can easily add an option to disable the vanilla potions, otherwise I'll just have to PR the hook in. I might be missing something but it appears a bearing is the only direction available to use. Pitch would be very useful because of the new wing mechanics. Implemented the bare bones of the functionality, need to fix a few things during the weekend. I also have to check back what else I should be implementing, haven't fulfilled some of the past request that I said I would (yet). Would version 1.9 work with forge 1.9.4? Or do we have to wait for an update? And update will be released next weekend most likely if things are stable enough.